Before beginning the study of the book of Revelation, it is important to review a generally recognized principle of interpretation that has been considered to be its basic framework for many many years. Ekkehardt Mueller of the Biblical Research Institute made this important statement: “In approaching the Book of Revelation, or at least certain sections of the book, one has basically two options. One can chose recapitulation or progression. “Recapitulationists perceive several parts of the Apocalypse as somewhat repetitious, and each of these parts seems to lead to the final consummation. In other words, the author repeatedly leads his hearers and readers over the same ground adding a new perspective each time. In the following pages, I will first diagram the recapitulationist’s view of the seven church, seven seal, seven trumpets before doing the same thing with the progression view, the view that I adopted years ago without realizing it. And as the downward arrows suggest, each of the seven churches are parallel to each of the seals and trumpets. Obviously, the first church, seal and trumpet cannot be parallel to the first plague because it, like the rest of the plagues, are all future. Neither do any of the others. There are other problems with the recapitulation view that I will try to illustrate in the following diagrams. The abbreviations “BC” refers to the Seventh-day Adventist Bible Commentary and “DR” refers to the book “The Prophecies of Daniel and the Revelation” by Uriah Smith. The numbers, of course, under the names of the seven churches are the times in the A.D. or after the birth of Christ. While the first church did experience many triumphs, it bears a strained relationship to the first seal which depicts ongoing victory and triumph with no failure whatsoever. The first trumpet, representing the Visigoths invasion of the Roman empire, took place some three hundred years after end of the first church period as suggested by the Commentary and Uriah Smith. Therefore, its relation to the first church is also strained. Consider also the discontinuity of the second church period (100-313 A.D.) with the “depredations of the Vandals in 428-486 A.D. that took place more than a century after the end of the second church. Much of this makes good sense, but notice a problem here. Even though Attila, of the third trumpet, died in 453, the “depredations of the Vandals” of the second trumpet took place later in 455. Logically, the Vandals, then, should be a third trumpet scenario rather than second in consideration of the dates given. While the wheat, barley oil and wine have been interpreted in the literal sense, to depict them in an agricultural setting, such as the “wheat” representing His faithful people in Matt.3:12 should be wholly acceptable. While Christ did not use “barley,” in the figurative sense, in Judges 7:13 a dream was related by one of the enemy host, where a “cake of barley,” representing Gideon’s little army, defeated them. In Christ’s parable of the day-long and the eleventh hour workers that were paid equally in Matt.20:2-13 suggests some similarity to the “wheat, barley” and the “oil and the wine” here. So, like the “wheat” and “barley,” the “oil and the wine” represent another sub classification of God’s precious people living under differing circumstances. A wonderful statement relating to that thought appears in Desire of Ages page 638: “Those whom Christ commends in the judgment may have known little of theology, but they have cherished His principles. Through the influence of the divine Spirit they have been a blessing to those about them. Even among the heathen are those who have cherished the spirit of kindness; before the words of life had fallen upon their ears, they have befriended the missionaries, even ministering to them at the peril of their own lives. Among the heathen are those who worship God ignorantly, those to whom the light is never brought by human instrumentality, yet they will not perish. Though ignorant of the written law of God, they have heard His voice speaking to them in nature, and have done the things that the law required. Their works are evidence that the Holy Spirit has touched their hearts, and they are recognized as the children of God.” Could they be represented by the “black horse?” Certainly! As you can see, there are three basic problems associated with the recapitulation view of the fourth church, seal and trumpet. Even though the fourth seal might be said to extend to the time of the Reformers, that is not parallel to “Hell” that follows the pale horse. Furthermore, since Thyatira reasonably well represents the experience of the true church during the Dark Ages, that period is past the time when “Western [pagan] Rome” became extinct and long before “the Reformers began their work. Consider also the celestial phenomena depicted in Rev.8:12 that is considered representative of the human leaders of the Roman government, which seems inconsistent at best. Note the disparity of the dates between pagan Rome from 168 B.C. to 476 A.D., while the church in Thyatira is supposed to represent the church’s experience during the dark ages between 538-1798. 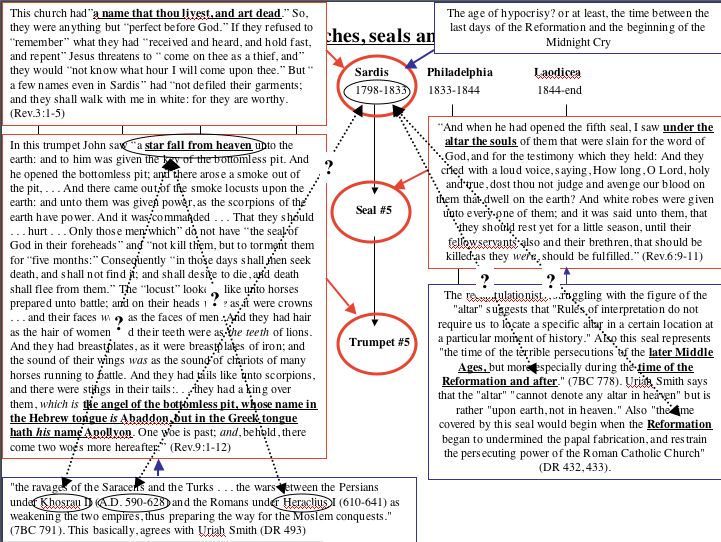 Uriah Smith’s assertion that the location of the “altar” depicted in the fifth seal is on earth rather than heaven, is valid. 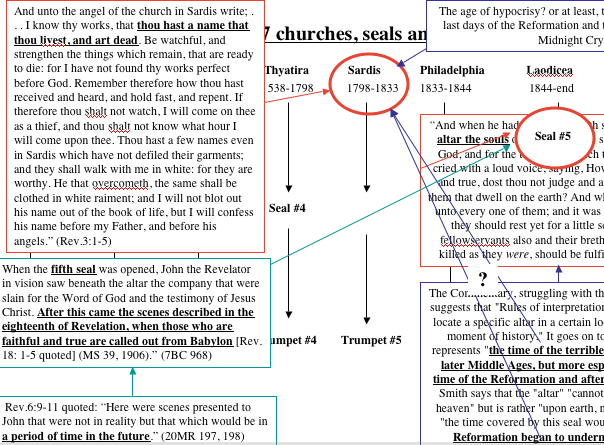 But, that the fifth seal represents the beginning of the Reformation, or like the Commentary that applies it to “the time of the Reformation” when it appears that Sardis most likely represents a post reformation period of time, makes this seal an unlikely parallel to the fifth church. The “star” that fell “from heaven” certainly cannot be representative of Khosrau or Heraclius since they were only human beings. Furthermore, the time specified for their activities as lying between “590 and 641” are more than 1,100 years earlier than 1798 when Sardis was supposed to begin. At this point, Ellen White jumps into the fray (so to speak): “When the fifth seal was opened, John the Revelator in vision saw beneath the altar the company that were slain for the Word of God and the testimony of Jesus Christ. After this came the scenes described in the eighteenth of Revelation, when those who are faithful and true are called out from Babylon [Rev. 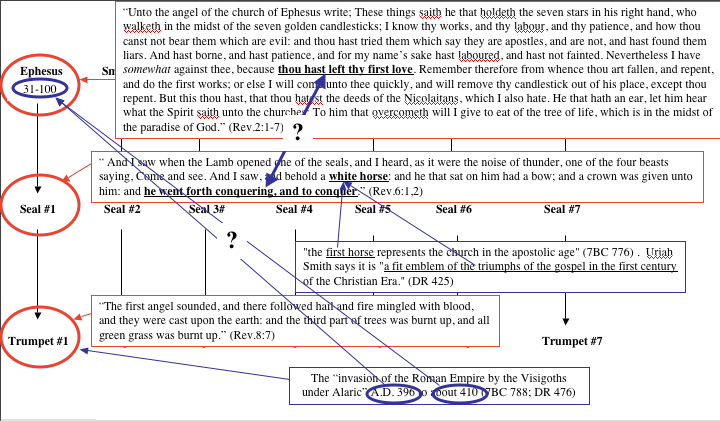 18: 1-5 quoted] (MS 39, 1906).” (7BC 968) Then after quoting Revelation 6:9-11 she said: ” Here were scenes presented to John that were not in reality but that which would be in a period of time in the future.” (20MR 197, 198) Both statements move the fifth seal into the future long after 1833 when the Midnight Cry began. This should also lead us to wonder what effect the future application of the fifth seal would have on the first four seals! If the fifth is future, it would seem the first four would also be displaced in some manner. The sequentiality of the sixth trumpet would also be affected for it follows sequentially with the fifth making it future as well! So, at this point we are forced to chose between the Commentary and the Spirit of Prophecy. If we chose the later, that would pretty much invalidate any credibility to the recapitulationists view of the churches, seals and trumpets and we should be receptive to the progression view. Note that the dates for the Lisbon earthquake, darkening of the sun and falling of the stars in the sixth seal were earlier than 1833, the beginning of the sixth church. Note also that the sixth seal extends to and is inclusive of the second coming even though the sixth church ends in 1844 while the seventh seal, rather than the sixth, is supposed to extend to the end. Also, the sixth trumpet is supposed to represent the Turks who “worship devils, and idols” and refuse to repent, while it is well known that Muslims abhor idols, fornication and thievery. 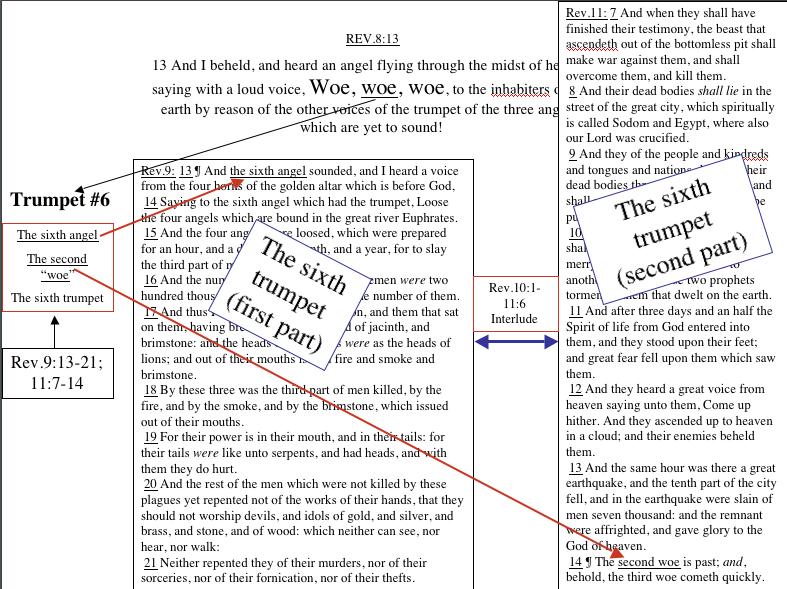 Interestingly, the Commentary (7BC, page 793) in its discussion of chapter 9, makes no mention of the parallel between the sixth trumpet which is the “second woe,” but alludes to it on page 804 in its discussion of chapter 11. Uriah Smith does the same in his discussion of chapter 11 page 542 but fails to recognize the “second woe” of chapter 11 on pages 505 to 517 while discussing chapter 9. Notice that the second woe is the sixth trumpet that begins in Revelation 9:12-21 and ends in Revelation 11:13 after which verse 14 says “the second woe is past.” That means the second woe ended in Revelation 11:13 where “a great earthquake” destroys a “tenth part of the city.” Does that mean everything from Revelation 10:1 to 11:13 is second woe scenario? No. What it means is that the second woe scenario is divided into two parts with the first part being Revelation 9:12-21 and the second part begins somewhere prior to Revelation 11:13. Can we be sure where the second part begins? Yes, but before pointing it out, we must remember that the trumpet scenario does not begin until Jesus “cast the censer into the earth.” (Rev.8:5) After that the trumpets begin to sound. This means that all the trumpets take place after the close of probation. If we are willing to accept that premise, it becomes very clear where the second part of the second trumpet begins. It begins in Revelation 11:7 where the two witnesses “shall have finished their testimony” which is indicative of the close of probation. Therefore, Revelation 11:8-13 depicts the last part of the second woe. 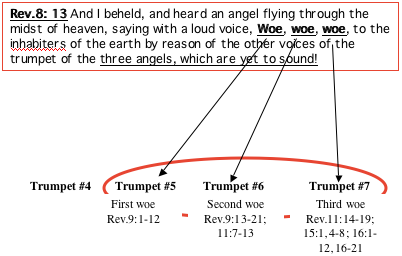 The Commentary remarks that the seventh angel in Revelation 11:15 “marks the beginning of the third woe and the end of the parenthesis between the sixth and seventh trumpets.” (7BCD 804) But note: when “the second woe (which is the sixth trumpet) is past . . . the third woe (which is the seventh trumpet) cometh quickly.” The word “quickly” is from “tachu” meaning “without delay.” Therefore, there is no “parenthesis between the sixth and seventh trumpets. The only “parenthesis” is found in the midst of the second woe inclusive of Revelation 10:1 to 11:6. 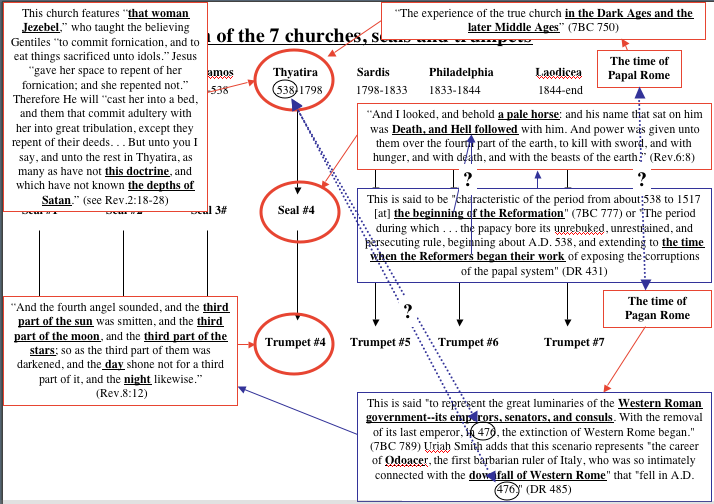 With such limited space this diagram shows only the recapitulationist’s view of the seventh church and seventh seal. Note the complete lack of parallelism between the indifference, spiritual pride and lukewarmness of the church in Laodicea with what is depicted after the seventh seal is opened in Rev.8:1-6. Note also the sequential disparity in the recapitulation understanding of verses 1-6 with the first verse representing the second coming, the second verse “announcing the judgments” which should precede rather than succeed the second coming. That is followed by the ongoing ministry of Christ in the heavenly sanctuary after which is the close of probation which is supposed to precede the second coming after which, according to Uriah Smith, is followed by the break-up of the Roman Empire. But, the Commentary, saying that verse 6 “might logically” follow the “close of probation” as depicted in verse 5, makes good sense even though it opts for the usually held view. 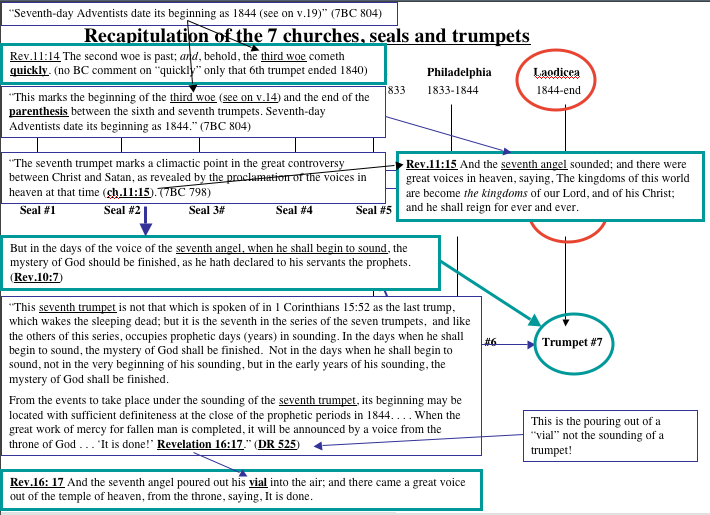 The background, in this diagram, has been removed to make it easier to see the recapitulation view of the seventh trumpet which, at best, is quite confusing. 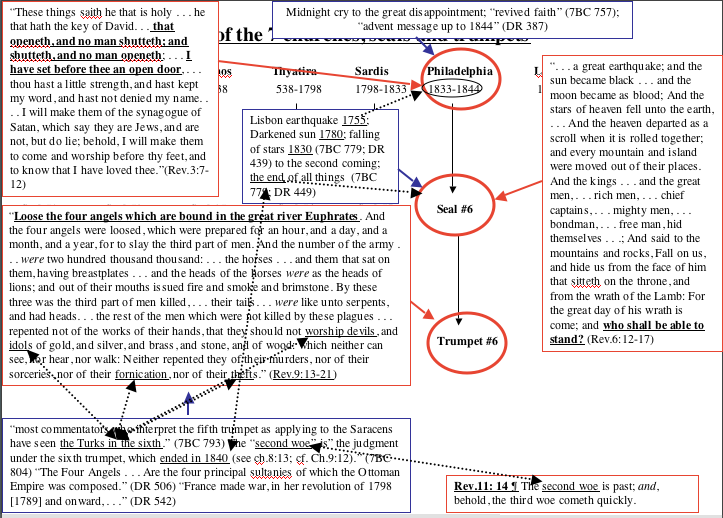 The Commentary quotes are seen in the upper portion of this diagram above Revelation 10:7 and Uriah Smith’s in the lower portion below Revelation 10:7. The first place the seventh trumpet is found in John’s vision, is in Revelation 10:7 where it is called “the seventh angel.” The Commentary’s remark about that verse indicates Revelation 11:15 as the time for the proclamation of that angel. Its comment, in turn, about that verse is that it marks the beginning of the third woe and the end of a parenthesis between the sixth and seventh trumpets. 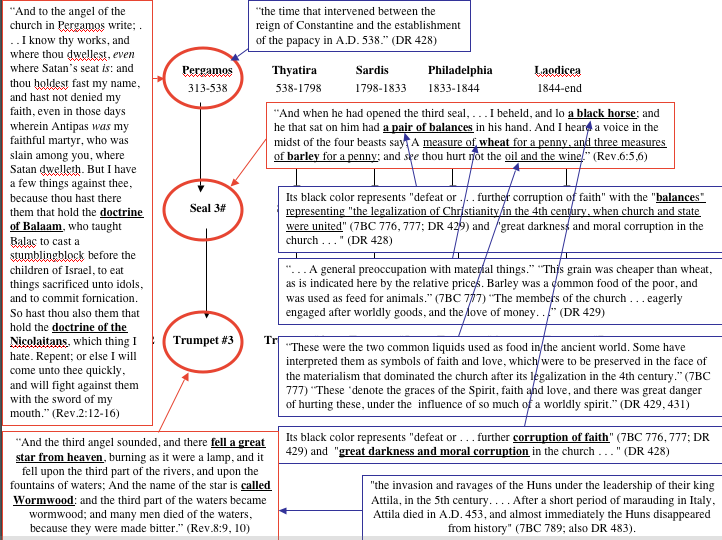 Then, in the top of the diagram, we see that the beginning of the third woe is supposed to be 1844. The problem with that view, is that the “second woe,” which is the sixth trumpet,” is followed “quickly,” or without delay by the “third woe” which is the seventh trumpet. Therefore, according to John, there is no gap or “parenthesis between the sixth and seventh trumpets” forcing us to rethink the traditional, recapitulation view. Unfortunately, the Commentary neglects to say anything about the word “quickly” in their comment on Revelation 11:14. Then look at the comments made by Uriah Smith in the bottom portion of the diagram taken from DR 525. 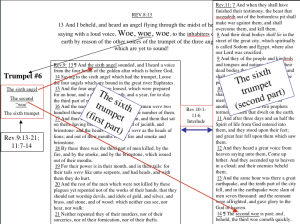 His major mistake is to equate the “seventh trumpet” with the seventh “vial.” If you check it out yourself, you will note that he makes no mention of the third woe which is clearly the seventh trumpet as the Commentary points out. While to some, pointing out the inconsistencies of the recapitulation view is destructive, that is not my intent. My intent is to be constructive. 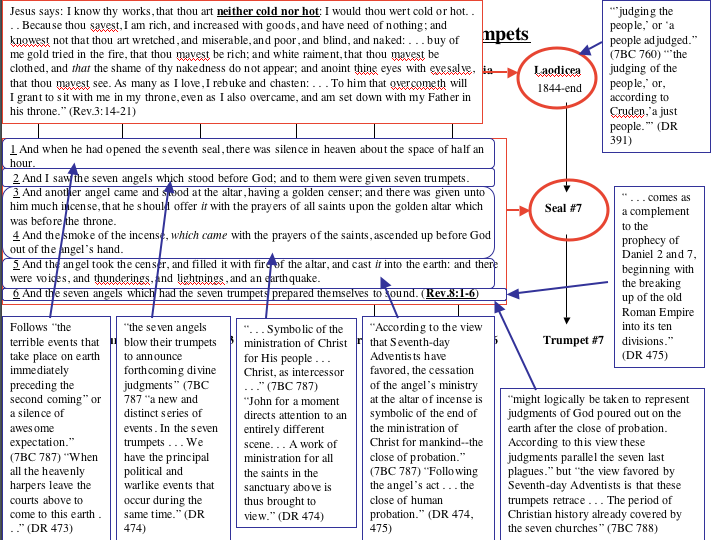 In the next part, we will discuss an alternative to the recapitulation view which is the “progression” format which, unintentionally it seems, has been the basis for my discussion of the book of Revelation.